Yesterday Dana announced it was laying off 108 people in St Marys and is eliminating the third shift at the plant. The plant that make frames for Ford's F-series pickup trucks is at 500 James Street South. Ford announced a 21% cut in its 4th quarter production earlier this month. Dana Corporation, based in Toledo, Ohio, is operating under Chapter 11 U.S. bankruptcy protection. Saturday, August 26 at Lions Park. Fish will be served 5 to 7:30 with music by Japser from 7 to 11. The new ratepayers association of St Marys Ontario will be presenting their petition of about 1200 names at the council meeting this evening. They will also be giving a presentation why they felt the need to form a ratepayers association; outline their financial assessment of how St Marys Council has done; and summarize the true costs of the Pyramid Recreation Centre. In addition they will be recommending Council hires a professional project manager; develop a business plan for operating the facilities; and request Council provide an open public meeting to discuss why they went forward, why they felt they did not have any obligation to respond to ratepayer criticisms and how future municipal projects can avoid the criticisms leveled at them for their handling of this project. This Sunday August 20 will be the 21st Annual Teddy Bears' Reunion. The event begins with a short parade at 1:00 pm from St Marys DCVI to East Ward Park on Elgin Street. At the park will be games, rides, crafts and Teddy Bear judging. Entertainment will be provided by Picks and Sticks. Pictured is a former award winner by Nancy Bax. A ratepayers association is being formed in St Marys. Its inaugural meeting will be tomorrow Thursday, August 17, 7pm at the Friendship Centre and is open to anyone. Membership fees will be determined at the meeting and will likely be in the $5 to $10 range. The group that recently collected more than 1100 names on the Pyramid Recreation Centre petition is forming the association(read the petition here). This Saturday, August 19 from 1pm to dusk there will be an open house at Junction Station, 480 Glass St. A corn roast and barbecue will take place at 4pm. Tickets are $5 available at the door with proceeds going towards restoration of the station. 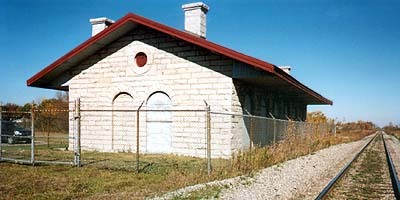 The station was erected in 1858 and abandonned in the 1940's. The Town has owned the station for more than a decade. St Marys is holding public meeting Tuesday, August 8 at 5pm on their plan to annex land from Perth South. The land is from south of the current town boundary to Highway 7, from the CNR in the west to the border of lots 11 and 12 in the east. Perth South will be holding its own public meeting the same day at 7pm. Perth South rezoned the land to highway commercial / industrial in October 2005. St Marys appealed the rezoning but just prior to the June hearing withdrew its objection. St Marys intends the land be used for industrial development. 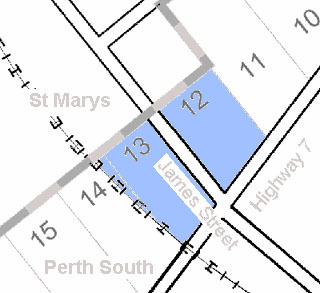 There has been no announcement on how much St Marys taxpayers will pay Perth South taxpayers for the land. Update: September 13, Perth County turned down the annexation request from St Marys.